Colin Baker is the Doctor in The End of the Line. Due to poor scripts, a BBC Comptroller with a personal grudge, and a backlash against “violent” television led by Mary Whitehouse, Colin Baker’s time at the Sixth Doctor is often looked upon as the low point of Doctor Who. He remains the only Doctor fired from the role, and as such is the only Doctor without a proper “goodbye” episode and regeneration scene. Six’s regeneration into the Seventh Doctor was preformed by Sylvester McCoy lying face-down in the Sixth Doctor’s clothes with a curly wig on his head, as Baker rightfully refused to come back to the show solely for a short farewell scene that would sum up all the problems and concerns that plagued his run. There are no bad Doctors or companions, only bad producers and writers. The Sixth Doctor: The Last Adventure consists of four hour-long stories that comprise the “final” story arc for the Sixth Doctor – End of the Line, The Red House, Stage Fright, and The Brink of Death. The first of these stories, End of the Line is a well-done affair that sets the scene for the eventual regeneration of the Sixth Doctor by introducing its ultimate villain, the Valeyard. As a stand-alone story, End of the Line is entertaining, creepy, and incredibly atmospheric with a well executed twist driving the dagger home. It’s sole low point comes from the introduction of a brand new Big Finish companion starring in her first official story well before her upcoming initial debut! Paul Morris and Simon Barnard are best known for the audio and comic book series The Scarifyers, starring Terry Malloy and David Warner (who replaced Nicholas Courtney upon his passing) as a ghost-story writer and a member of MI:13 who fight the supernatural. The series is a a mix of comedy and horror, which puts the two men right at home as writers for Jago & Litefoot. End of the Line leans more towards the “horror” side of things, conjuring up images of the Tenth Doctor episode Midnight – an isolated train station, the passengers unable to leave, and something unexplainable causing them to turn on each other. It’s very well done, and most importantly it all make sense. C follows B which followed A and so on. While we can’t yet see how End of the Line ties into the greater picture, it does provide an explanation for the Valeyard’s overall presence, thanks to Michael Jayston’s cameo as the villain, as to how he might have possibly survived the final events of Trail of a Time Lord. 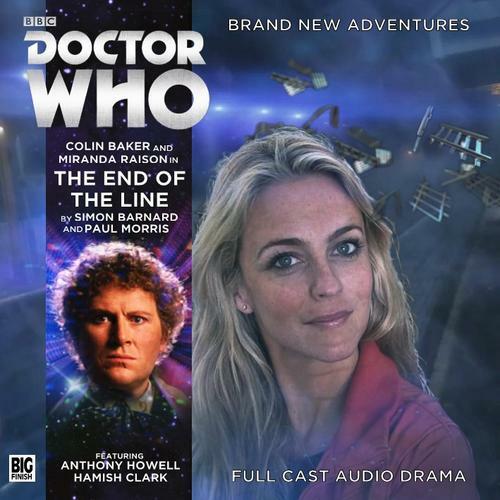 It’s important to note that The Sixth Doctor: The Last Adventure is NOT the final story Colin Baker is doing for Big Finish, as there’s a main range trilogy coming out in a few months with new companion Constance as well as the Rani. It’s simply the final story for the Sixth Doctor, the end of the line being revealed even though the journey is still ongoing. Imagine River Song whispering “spoilers” or something. 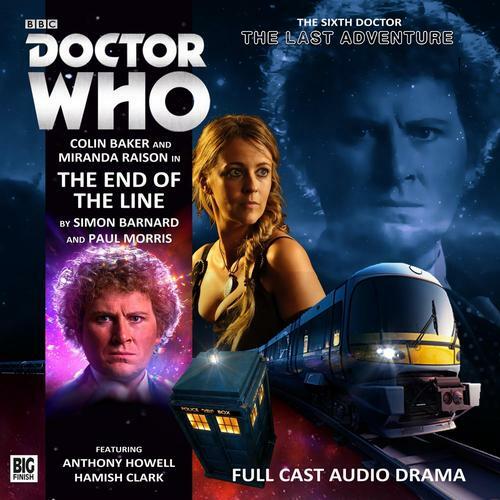 End of the Line gives listeners the standard Colin Baker Big Finish performance: an amazing one. It’s the Sixth Doctor we know and love, doing his best to take charge, getting indignant when someone contradicts him or stands stubbornly in the wrong, explaining everything with that “of course I know what I’m talking about” bravado, and bravely stepping forward when everything looks the darkest. Add to it the verbal sparring when the Doctor confronts the big guy of this particular piece, and End of the Line gives us nothing less than a great turn by Baker as the Sixth Doctor to open up his final adventure. Miranda Raison is a well-known British actress, starring in the BBC series Spooks and Death in Paradise as well as 24: Live Another Day. She also starred in Daleks in Manhattan/Evolution of the Daleks and taken part in several Big Finish pieces including The Davros Project and The Romance of Crime. Raison is currently set to star in an upcoming main range trilogy with the Sixth Doctor as a new companion, Constance Clarke, ice cold and intelligent member of the Women’s Royal Navy Service. Maybe it’s a callback to how Mel just suddenly appeared in Terror of the Vervoids without a proper introduction in that this is Clarke’s first published adventure, but not her first meeting with the Sixth Doctor! It does throw things off a bit, and threatens to make Clarke a Mary Sue type – hey, look at this new character, isn’t she amazing, the Doctor loves her, why don’t you love her too – but thankfully that doesn’t happen. Because we don’t anything about her, it’s a bit hard to get a grasp on Mrs. Clarke’s character, but she does all the things that a proper companion of the Sixth Doctor needs to do. She’s brave, smart, not afraid to needle the Doctor, not afraid to admit that there are things she can’t quite wrap her head around, and the Doctor trusts her enough to let her run off if need be. I feel like I’m giving Raison short shrift here as she does a fine job, but it’s tough to pin down anything specific since this is the first time we’re meeting the character and we don’t know anything about her! What I can say is that her performance makes me look forward to the main range releases due out in September for her official introduction! End of the Line is an ensemble story with a cast of secondary characters who make the most of their parts and help elevate the story. Maggie Service (Elsie from Deep Breath) plays Hilary, the hard working clerk who is missing an important interview due to the train delay (shades of Toomey from The Langoliers) and her slow descent into panic adds weight to her unconscious reaction to the situation and a bit of sympathy to her final fate. Alice, played by Ony Uhiara (The Crouches), slowly descends into madness during her time at Kettering Junction. Her realization of the situation and how she deals with it is chilling and very well acted on her part. Tim Hope (Sergeant Milner from Foyle’s War is solid as Tim Hope, passenger and commuter who handles the “things are going sideways, I don’t know why, but I’m going to keep my head” side of things. The first of two standouts from this impressive cast are Hamish Clark, of Monarch of the Glen fame, as ticket collector…sorry, customer service manager Norman, who’s insistence on following orders and regulations ties into a much larger design. Clark plays it quiet but firm, insisting the rules must be obeyed because they come from on high. Chris Finney from In the Flesh rounds out the cast as trainspotter Keith, who absolutely knows something is going on at Kettering Junction as everything he initially saw is being changed around. His curiosity and determination are evident early on, and he and will stop at nothing to ensure the Doctor does what’s necessary to make thing right. With regards to the Big Finish sound crew, they’ve done their damnedest to make as creepy as all get out. It’s an abandoned train station, surrounded by fog, so every footstep on gravel, every knock on a window, every distant scream, the noise that announces the villain’s presence…not quite goose bumps, but there’s definitely a bit of skin-crawling thanks to their work! End of the Line is a great beginning to Six’s final story. I’m not quite sure yet how it ties into the grander scheme of the The Last Sixth Doctor Adventure, but as such this one acts as a great one-off adventure thanks to a haunting setting that drips with atmosphere and all the actors and actresses on top of their game. Cobi’s Synopsis – The end begins here as End of the Line provides Baker with a new companion, a creepy setting, and the weaving of the threads that tie into his final fate. This entry was posted in Big Finish Review and tagged Big Finish, Big Finish Audio, Big Finish Review, Colin Baker, Constance Clarke, Doctor Who, Doctor Who Audio, Doctor Who Review, Miranda Riason, Sixth Doctor, TARDIS, The Last Sixth Doctor Adventure, The Valeyard. Bookmark the permalink. Hey! I’ve nominated you for the Liebster award! checkout my blog for details.